The Schaders were German immigrants who settled in Pulaski County, Arkansas. They operated a family grocery store at 1600 Cross Street in Little Rock from the late 1800s until 1968, when the store closed. 4. 1859 April 18: Joseph A. Schader, Napoleon, Arkansas, to "Friend Merkel, Mother, Brothers and Sister"
7. 1859 November 25: Joseph Boos, St. Marie, Illinois, to "Brother-in-Law and Sister"
8. 1864 March 26: Joseph A. Schader, Little Rock, to "Mother, Brothers and Sisters"
9. 1865 February 2: Joseph A. Schader, Little Rock, to "Mother, Brothers and Sisters"
11. 1865 May 4: Joseph A. Schader, Little Rock, to "Mother, Brothers and Sister"
12. 1868 March 24: "Niece," Napoleon, Arkansas, to "Aunt"
13. 1870 November 15: Mary Boos, St. Marie, Illinois, to "Cousin"
14. 1894 September 22: Bertie, Georgetown College, to "Grandma"
16. 1918 June 20: Josie and Pete, Cincinnati, Ohio, to "Friends"
20. 1925 October 13: Paralee Donald, Toledo, Ohio, to "Friend"
23. 1926: Marguerite, St. Louis, Missouri, to "Little Mother"
41. Undated: Sophia L. Schader to "Ma"
The Arkansas History Commission will be closed Thursday, January 1st for New Year's Day. We will open again on Friday, January 2nd with regular hours. The Arkansas History Commission has a number of digital collections online. Our Doc a Day collection highlights Arkansas during the Civil War and the collections contains hundreds of documents and photographs that currently span 1861-1864. We will continue to add 1865 documents and photographs to this collection through April. To access that collection, please visit: http://www.ark-ives.com/doc-a-day/ . The Arkansas Digital Ark-Ives is another collection of online digital material. This project currently contains all five of Arkansas's constitutions, historic maps, resource guides, educational lesson plans, World War I material, Arkansas postcards, the history of the Arkansas state flag and music from the Ozark Folk Life and Culture collection. The Arkansas Digital Ark-Ives project is ongoing and we are currently working to add several more collections in the coming months, including a collection highlighting Arkansas's multicultural history, women's history and in celebration of our 110th birthday in 2015, we will be adding a collection that will showcase a variety unique material picked by our staff. We're excited about our upcoming additions! To view our current online collections, please visit http://cdm16790.contentdm.oclc.org/ . The Arkansas History Commission will be closed from Wednesday, December 24 through Saturday, December 27 for the Christmas holidays. We will reopen on Monday, December 29 with regular business hours. We will also be closed on New Years Day. Thank you for subscribing to The Arkansas Archivist! Look inside the December issue for these and other features. In November, the Arkansas Humanities Council awarded a program grant to the Arkansas History Commission and its Northeast Arkansas Regional Archives (NEARA) branch. The grant in part supports a public program on January 15, 2015, at Powhatan Historic State Park. The program, Erasing Boundaries: Lawrence County at 200, will feature a variety of speakers presenting research on the political, social, and economic history of territorial Arkansas, and the early archaeology of the region. For more information or to register for the program, contact the Arkansas History Commission at tatyana.oyinloye@arkansas.gov or call 501-682-6892. Conservation of Arkansas’s constitutions, Quapaw treaty, and secession document — the statehood documents — spanned a number of decades, and the conservation work performed reflects changing views on appropriate treatments for paper. Memorial Grant Program. This project will result in the compilation of biographical research on Lewis, a well-known African American artist and land owner from Pine Bluff in the late 1800’s. The Curtis H. Sykes Memorial Grant Program offers grants to fund projects related to African American history in Arkansas, and is currently accepting applications. Potential applicants should note that the deadline for submitting applications to be considered during the next funding cycle is 4:30 p.m. on Friday, January 2, 2015. If you were a child growing up in Arkansas in the 1970s, there’s a good chance that the first cartoon characters you got excited about meeting at an amusement park weren’t wearing mouse ears or princess costumes. The AHC has decided to start a Pinterest board on Dogpatch to share some of the more interesting finds from our collection. We also would like to invite members of the general public to share your pictures or memorabilia of Dogpatch with us and our Pinterest followers. John E. Knight was born in Newburyport, Massachusetts, in 1816. In 1843 he married Hannah Donnell in New York, and came to Little Rock, Arkansas, that same year. Knight was editor of the Arkansas Democrat from 1846 to 1850. He was also associated with the Arkansas Gazette. He had one daughter, Elizabeth Knight, who married James S. Pollock, a banker in Little Rock. Knight died in Little Rock, Arkansas, on October 28, 1901, and was buried in Mount Holly Cemetery. Elizabeth Knight Pollock died in 1910. The AHC has created a new Pinterest board about Dogpatch USA and is inviting the public to participate. We'd like you to share your scanned photos and memorabilia on our board and help us create an online archive dedicated to the history of Dogpatch. Located on Hwy 7 between Harrison is Jasper, Dogpatch was a well-loved Arkansas theme park that was popular during the 1970s and 1980s. Many Arkansans have wonderful memories of time spent there and we look forward to seeing what our patrons have to share. We have 2 ways in which to participate. You can pin directly to the Dogpatch Memories board or you can email us your images and we will pin them for you (credit will be given to anything shared). If you'd like to contribute to the board, please send us an email at history.commission@arkansas.gov with the Requesting Pinterest Invitation in the subject line. We'll send you an invite directly from the board which will allow you to pin to it. If you'd rather email us images, you can send us an email to the same email address with Dogpatch Contribution in the subject line. We often get questions about specific subjects and whether or not we have something related to that subject in our collections. In our research room, we're able to hand out printed resource guides that help answer those questions and guide researchers through our collections. We're excited to announce that we are now offering those resource guides online! We've added our current resource guides to our online digital collections. Topics include the Civil War, World War I, Arkansas governors, state parks, African Americans in Arkansas, immigration and the history of Arkansas foodways. Just click the link below to view the guides. We'll be adding a new resource guide next week that highlights multicultural resources in our collection and in March, we're adding a women's history resource guide. We hope this helps you, our patrons, in your research! “I don’t remember when I began singing. About the time I began talking, I suppose. A tornado struck the Riddle’s home on November 25, 1926, and Almeda lost her husband and one child. Almeda’s treasury of songs was first discovered by John Quincy Wolf in 1952. He began field recordings of her songs and stories, and word began to spread about this invaluable and untapped resource in the Ozarks. Alan Lomax, the famous folklorist, recorded Almeda Riddle in 1959 and brought her into the world of professional folk singing and lecturing after Almeda’s mother died in 1960. It was always her goal to put the song before the performance. In other words, the lyrics and stories told in the ballads were more important than any showmanship brought by the singer. Almeda spent many years appearing around the country at universities and folk festivals. Almeda also would frequently perform at the Ozark Folk Center in Mountain View, singing her ballads and telling her stories. Almeda Riddle’s performances at the Ozark Folk Center can be heard in the recordings donated to the Arkansas History Commission. 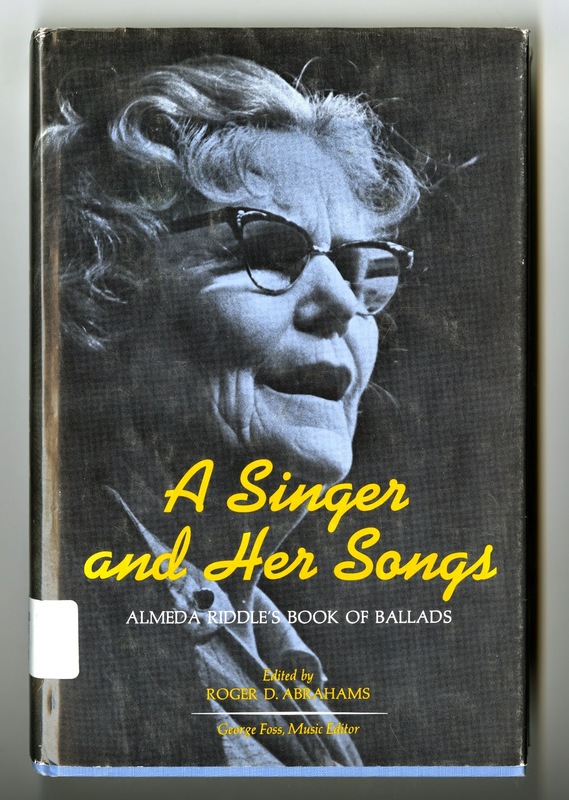 The book, A Singer and Her Songs – Almeda Riddle’s Book of Ballads can be found in the book stacks at the History Commission. George West’s obituary of Almeda Riddle can be found in the Folk Music Journal Sing Out!, which can be found at the Arkansas History Commission with the journals and periodicals. Stephen K. Stone, 1819-1909, was the son of Parker F. Stone and Kindness Hicks Stone. Stephen K., a Fayetteville, Arkansas, merchant and capitalist, came to Arkansas in 1840. He began his career as a clerk in a dry goods store and later became a farmer. In 1845 he opened his own dry goods store, which he operated until his death. Stone was a leading citizen of Fayetteville and invested in construction and land improvement in the area. On September 23, 1842, he married Amanda M. Brodie. Stephen and Amanda were the parents of seven children: Mary Albright, Stephen R., Benjamin H., William C., Ludowick, Amanda M., and Albert Brodie. The AHC is going to be kicking off a new monthly blog series called Mystery of the Month. Each month, our own Brian Irby will be researching and writing about some of Arkansas's little known mysteries and presenting them here. To kick off Mystery of the Month, Brian has written an intro for our new series. Many of us have come to history from the oddest of angles. For instance, when I was a kid, my grandmother had a lot of books on the bookshelves in the living room. My grandparents had a habit of leaving money, usually a dollar or two, or even a ten dollar bill, in the books and then forgetting the hidden treasure. So, I discovered that one could easily find cash by exploring the bookshelves. But, aside from the obvious joy of treasure hunting, there were some interesting books. Among them was a book called Ozark Tales and Superstitions. I read that book cover to cover, absorbing its tales of buried treasure, ghosts, and folklore. I read them so many times that I could probably recite the stories from memory. If I try hard enough, I can even recall the illustrations that went with the stories. Did I believe the stories? You bet I did. I was quite certain that Jesse James faked his death and lived out his days as J. Frank Dalton in Oklahoma. It was in a book, after all. They couldn’t print it if it wasn’t true, right? Now that I am much older I am less inclined to accept those folktales as being true. I had forgotten about the book until I was here at work at the Arkansas History Commission and found the volume on the shelves next to other books on Ozark folklore. Instantly, I remembered the story that, above all other stories in the book, so gripped my imagination at the age of eight. The story goes that a man was on the run from the law near War Eagle, Arkansas, when he stumbled into a cave called Peter Bottom Cave. What he saw so horrified him that he fled from the area and got caught by law enforcement. He said there was a monster in Peter Bottom Cave. Not much more was said on the matter, the fugitive was sent to prison, and his monster tale was quickly forgotten. Years later, a couple of young men also claimed to have seen the monster. According to the men, it was a tall humanoid figure with white fur and a musty smell. To top it off, the monster also emitted a beeping noise. Supposedly people still see this monster from time to time, but like Big Foot, he is incredibly camera shy, so no photographic evidence is available. So, upon becoming reacquainted with the book on folklore, I was propelled back into the world of the strange, the mysterious, and the downright odd. It occurred to me that we have a number of resources that can be used to research these mysteries. So, in the next few months I will be sifting through our newspapers, books, and manuscripts to bring you a fresh perspective on some of Arkansas’s most enduring mysteries.